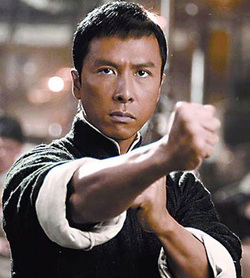 Siu Lim Tao is the first of the hand forms of Wing Chun, the other two are Chum Kiu (Seeking Bridge) and Biu Gee (Thrusting Fingers). Siu Lim Tao is a basic form for beginners. Grandmaster Ip Man described that in "Siu Lim Tao or 'little idea', the ideas of daily matters, such as money, work, hate, love, etc.... 'decrease to as little as possible, or even none', so that the practitioner may 'concentrate only upon practicing'. " Siu Lim Tao is the basic Kung Fu of Wing Chun. That is why almost every Wing Chun Sifu, when teaching his students, always wants the students to practice 'Siu Lim Tao' first. Siu Lim Tao is divided into three sections, with a total of one hundred and eight movements. Each small section has its own aim in practice, and various meanings in application. The first section is for training the basic strength of the wrist and elbow. The strength is in the formation of the major hand positions of Tan Sau, Fook Sau, and Wu Sau. If you wish to perform well in Wing Chun, you must use the first sections of Siu Lim Tao to train the basic power and strength. There is no short cut, once the movements of the form have been learned, they must be practiced seriously to train the power and strength. Every Wing Chun practitioner knows when practicing the first part of Siu Lim Tao, that it has to be slow. To train for the strength one has to be serious, and to be serious one must do it slowly. The second section is the training of using the strength and power. In Wing Chun Kung Fu, the strength and power are used half soft, half hard. This is easily demonstrated when throwing a punch, your arm travels at great speed but the muscles are relaxed, this is the soft part. But just before you make contact with your opponent, your muscles in your arm tense up for a split second, this is the hard part. This later developes into full delivery of the Kinetic Energy of your arm and body into the target, without compromising balance. The third section is for training correct position of the basic hand movement into your muscle memory. Movements include Pak Sau, Tan Sau, Gaun Sau, Huen Sau and Bong Sau. The practitioner must concentrate on executing each movement's position correctly.